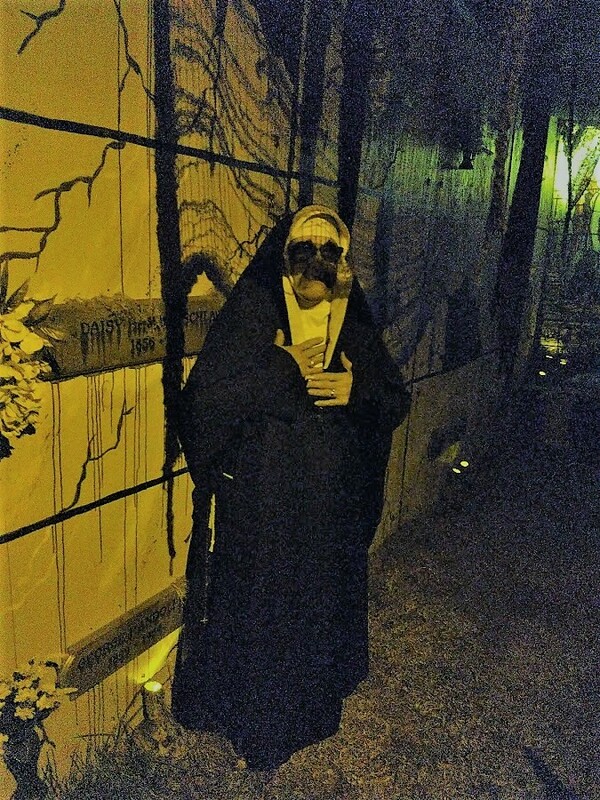 The biggest home haunt in Orange County, The Haunt at Daisy Avenue provides an elaborate walk-through containing multiple realms of horror. There is a nursery with a crying baby, a meat locker with a carved body, a garden area with a living corpse, a mausoleum, catacombs, and more. Along the way we see ghastly portraits on top of skeletons and skulls, spellbooks and a Ouija board presided over by a live Medium. A butcher asks if we want to “hook up later” while holding a hook in his hand. We escape only to come to a room with bodies dangling from the ceiling. Hopefully we are not scrumptious enough for the butcher to want to keep us in his “meat locker.” Turn the corner into a church - wait, its a mausoleum. That’s okay - there's a nun to help. No, wait - she's choking on a cockroach: “Yummy,” she cries after spitting it out. The next turn lead into a tomb, which we must brave in order to escape this dark realm. Hoping we would be left alone with no unearthly spirits, we slowly inch forward while observing skeletons with rotting flesh pinned on the walls. Perhaps we were too hopeful as we are met by a phantom before the exit. Luckily, it lets us live. You can still catch Haunt at Daisy Avenue's November 1 Lights-On Tour from 7pm to 9pm. If you’re interested in learning about how a haunt is produced, come to their Clean Up Party on Saturday, November 4 at 9am, and if you would like to carry on tradition with their custom designed sets and props, they are holding a once in an after-lifetime sale on Sunday Nov 5th at 9am. We are sad to say that this is Haunt at Daisy Avenue’s final Halloween. 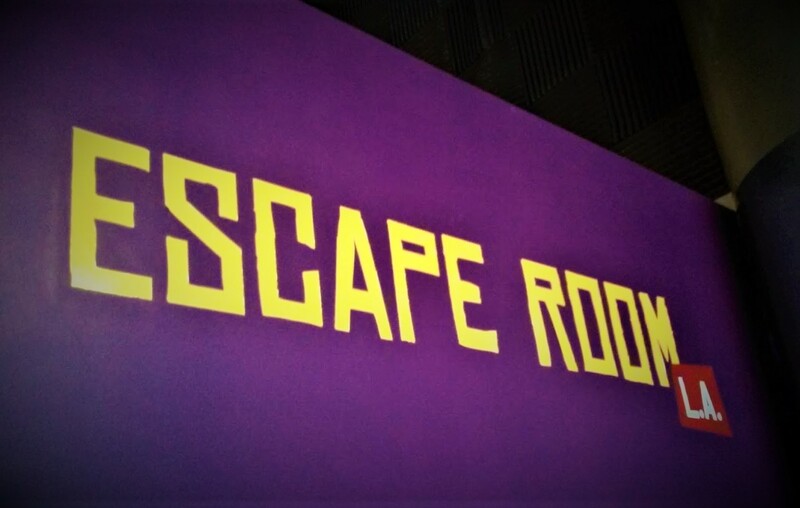 Fortunately, they are moving on to bigger and better things: an escape room. Thanks for the memories, Haunt at Daisy; we look forward to your new endeavor next Halloween. The proprietors are expected to relocate; so to the city of Orange: Get ready for a Nocturne Adventure! The Haunt at Daisy Avenue is located at 16887 Daisy Avenue, Fountain Valley, CA 92708. The website is thehauntatdaisyavenue.com. 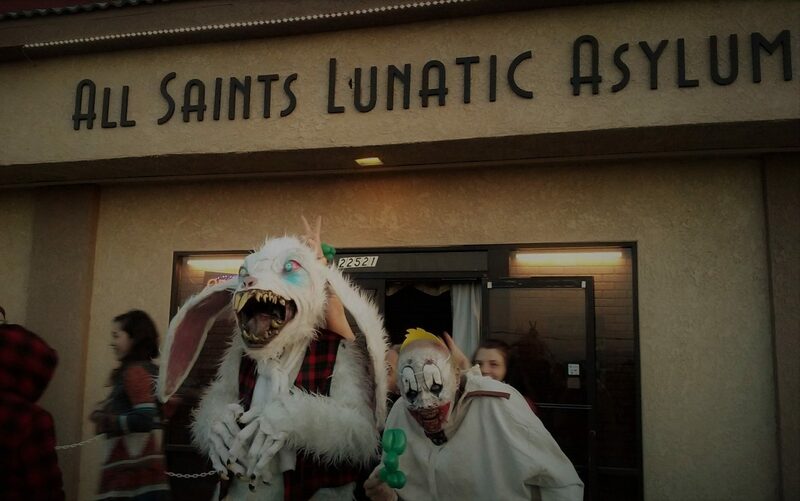 Orange County’s largest home haunt is elaborate walk-through with multiple realms of horror. I am a Professional Networker, Business Owner, Musician, Producer, Composer, Songwriter, and Connectionaire.